There is single type and gradation type. I bought the gradation type because it looked nice and I though it would be fun to apply. I don't really like the color cosmetics from Estee lauder but I just did impulse buying. Personally I like pink color but from long time of decision-making I picked the peach color. I like the color, persistence, and the brush. Many people asked me what blush I use and so I bought another color #14 rose nuisance. Personally I go well with pink color better than peach so I had to go and purchase it. However lacks on the abundance of the hair. 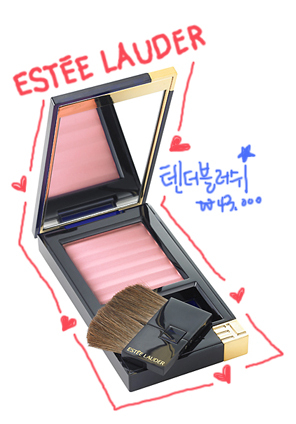 This is recommended to people who are looking for new blush or first time to purchase a blush. ‘Dandelion’ works just fine so you don’t have to change it. There are some sayings from the dermatologist that blusher gives blotches on the face and other more. Don’t stimulate your cheek too much. If you are applying use good quality of brushes and don’t do over touches on them. Just buy blushes that give persistency and great color so you can only overlap once or twice.